Take a look at Massachusetts, which has nine congressional districts. A little more than one-third of the state’s voters vote Republican, so in a perfectly representative system, three of those seats would be held by Republicans. But Massachusetts hasn’t sent a Republican to Congress since 1994, and for a simple reason: Republicans don’t make up a majority in any single district. That’s where multimember districts come in. By itself, these new districts wouldn’t solve the problem. Democratic voters would still dominate in every district and prevent any Republicans from being elected. The solution is to elect members through ranked-choice voting, a process in which voters rank listed candidates in order of preference. This sounds complicated in theory, but it works smoothly in practice — ranked-choice voting is already used in cities around the country, and in all statewide races in Maine, without trouble. In multimember districts, each party is allowed to run as many candidates as there are seats, so in the Massachusetts example, voters would get a ballot that included three Democrats, three Republicans, plus a few other candidates from any third parties that were able to field them. Voters would then vote for three candidates, in order of preference. WHEN pollsters ask Americans which party they plan to vote for in the elections for the House of Representatives this November, those preferring the Democrats lead those preferring the Republicans by around seven percentage points. 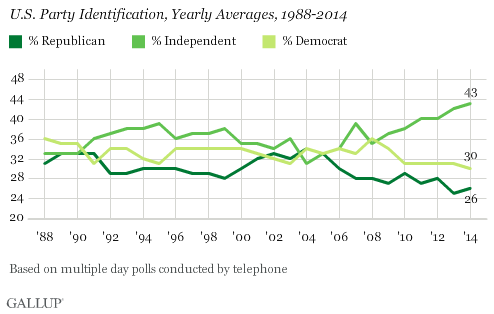 But this does not mean the Democrats are a shoo-in to win the House. The Economist’s statistical model of the race for control of the House of Representatives—which uses this sort of “generic ballot” polling, along with other data—currently says that, although the likelihood of a Democratic majority in the popular vote is a remarkable 69.9%, the Republicans still have a 30% chance of holding on to the House (see chart 1). The source of this discrepancy is that Democrats will win their seats with big majorities in fewer districts, whereas Republicans will prevail by narrower margins in a larger number of districts. In 2016 Democrats who beat Republican opponents won an average of 67.4% of the two-party vote in their districts, whereas Republicans who defeated Democrats received an average of 63.8%. This imbalance is partly due to deliberate attempts to create districts that provide such results, and partly just down to the fact that Democrats tend to live more tightly bunched together in cities. Together, these two factors put up quite an obstacle. According to our model, the Democrats need to win 53.5% of all votes cast for the two major parties just to have a 50/50 chance of winning a majority in the House. If this imbalance were limited to a single chamber of the legislature, or a single election cycle, the Democrats’ frequent carping about a stacked electoral deck might sound like sour grapes. All electoral systems have their oddities. 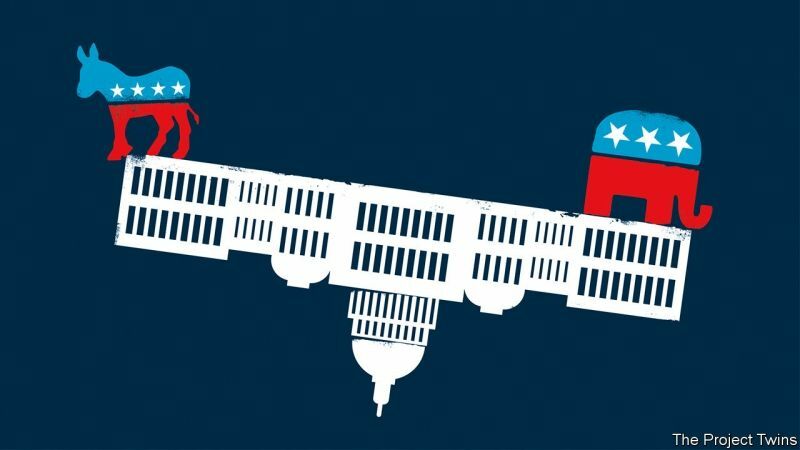 But changes in where Americans live and contradictions in their constitution—a document designed to work with many weak factions that has instead encouraged and entrenched an increasingly polarised two-party system—have opened gaps between what the voters choose and the representation they get in every arm of the federal government. In recent decades these disparities have consistently favoured the Republicans, and there is no reason to think that trend is going to change on its own. 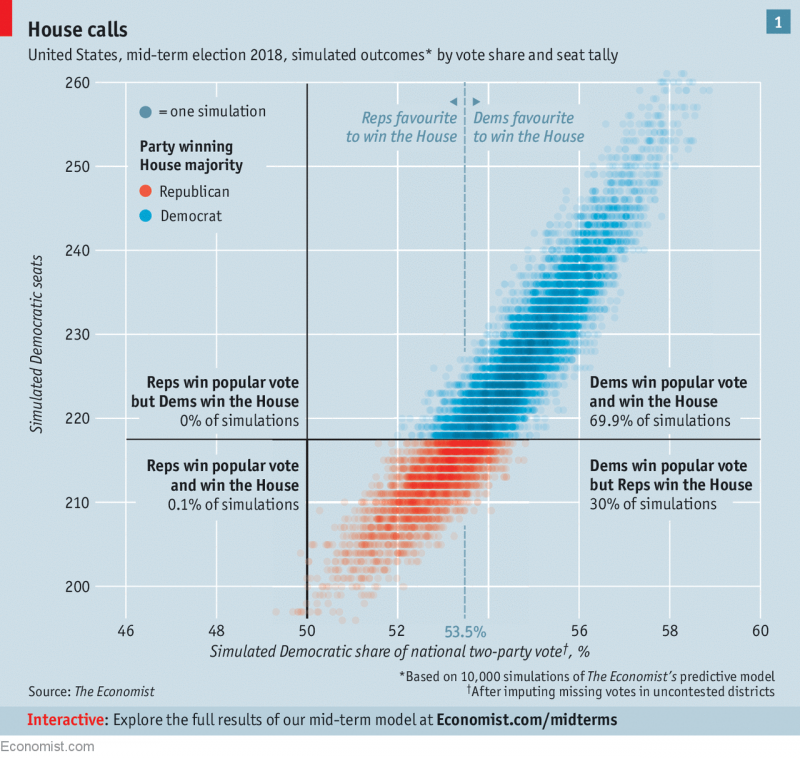 In the past three House elections, Republicans’ share of House seats has been 4-5 percentage points greater than their share of the two-party vote. 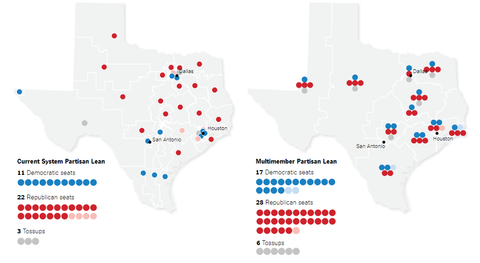 In 2012 they won a comfortable 54% of the chamber despite receiving fewer votes than their Democratic opponents; in 2014 they converted a 51% two-party-vote share into 55% of the seats. Such comparisons are harder for the Senate, where only a third of the 100 seats are contested in any election. But adding together all the votes from the most recent election of each senator, Republicans got only 46% of them, and they hold 51 of the seats. According to research by David Wasserman of the Cook Political Report, an electoral-analysis site, even if Democrats won the national vote by six percentage points over a six-year cycle, they would probably still be a minority in both houses. That the Senate should be disproportionate would not have disappointed the men who wrote America’s constitution. They wanted it to represent places, not people, and there is a case for that; other constitutions, such as Germany’s, look to ensure regional representation in their upper house. But when it comes to its presidency, America stands alone. In all the world’s other 58 fully presidential democracies—those in which the president is both head of state and head of government—the winning candidate gets the most votes in the final, or only, round of voting. But due to the “electoral college” system that America’s founders jury-rigged in part to square the needs of democracy with the demography of slavery, this does not hold true for America. 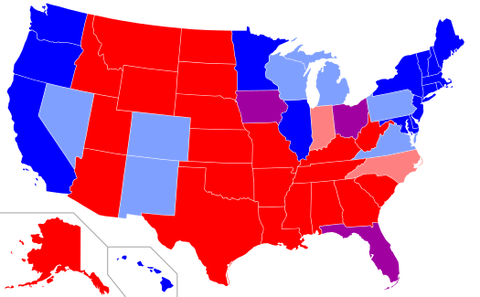 States vote in the college in proportion to their combined representation in both houses of Congress. This set-up means that a candidate who wins narrowly in many small and smallish states can beat one who gets more votes overall, but racks most of them up in big majorities in a few big states. During almost all of the 20th century this did not matter much; the candidate who got the most votes won every election from 1896 to 1996. But both of the past two Republicans to win the presidency have received fewer votes when first elected than their Democratic opponents did. In the contest between Al Gore and George W. Bush in 2000, this margin was a modest 0.5 percentage points. In 2016, however, it was substantial: Hillary Clinton’s lead of 2.1 percentage points was larger than those enjoyed by the victorious John F. Kennedy in 1960, Richard Nixon in 1968 and Jimmy Carter in 1976. Is a dream a lie if it don’t come true? America’s various disproportional representations are the result of winner-takes-all voting and a two-party system where party allegiance and geography have become surprisingly highly correlated. Places where people live close together vote Democratic, places where they live farther apart vote Republican (see chart 2). Under some electoral systems this would not matter very much. Under America’s it has come to matter a lot, in part because of an anti-party constitution. America’s founders wanted power to be hard to concentrate, and for people who held some powers to be structurally at odds with those who held others. To this end they created a system in which distinct branches and levels of government provided checks and balances on each other. They hoped these arrangements would be sufficient to hobble any factions which sought to co-ordinate their actions across various levels and branches of government. The first two presidents, George Washington and John Adams, both warned that a two-party system, in particular, would be anathema to the model of government they were trying to build. Aware that they could not solve the problem of parties altogether, the founders thought the constitution would at least ensure that they were reasonably numerous and ineffectual. But some of the features they built into it inadvertently encouraged politicians to concentrate themselves into just two blocs. And some of the mechanisms they put in place to guard against other concentrations of power went on to exacerbate the problems that such a two-party system can cause. Take the Senate. To make sure the largest states do not dominate the rest, the constitution provides equal representation for all the states, large and small alike. This builds in an over-representation for people in small or sparsely populated places. For most of the country’s history, that bias had only a modest impact. The parties the founders feared competed strongly with each other in both urban and rural areas. Recently, however, population density has become a strong proxy for political preferences. Today the 13 most densely populated states have 121 Democratic House members and 73 Republican ones; the remainder have 163 Republicans and 72 Democrats. According to data compiled by Jonathan Rodden of Stanford, nearly half the variance in the county-level vote shares in the presidential election of 2016 could be explained solely by their number of voters per square kilometre. Now that the rural has a party, a constitution that favours the rural favours that party. After the civil war, population and voting were, in principle if not in Jim Crow practice, aligned. But the electoral college persisted, and with it a second formal bias towards low-population states, though not as marked as the one in the Senate. As of the census of 2010, the five most rural states wielded about 50% more electoral votes, and three times as many senators, per resident as the five most urban ones did. True to the ideal that power should be dispersed, the constitution makes the drawing of districts for House elections a matter for the states. But once there were national parties that competed for state office, too, governors and state legislatures lost little time in drawing up districts specifically designed to improve their party’s chances on the national stage. This gerrymandering is not a new phenomenon; it got its name in 1812. In the run-up to an election held in 1841, the Democrats running Alabama chose to use a voting system in which all five representatives would be elected statewide, ensuring an all-Democrat delegation. Fearful of similar setbacks elsewhere, the Whig majorities in both houses of Congress passed a law requiring all states to use winner-takes-all, single-member districts. In 1932 a Supreme Court ruling enabled states to reinstate statewide elections for House members, and many did. But in order to prevent southern states from denying representation to black voters Congress restored the single-member-district requirement in 1967. As a party of the cities, today’s Democrats would find themselves at a disadvantage in any geographically based winner-takes-all electoral system in which receiving 99% of the vote is no better than getting 51%. But gerrymandering adds to the disadvantage. Republicans run more state governments than Democrats do, in part because in state legislatures, too, the Democrats concentrated in cities tend to win bigger majorities in fewer districts. 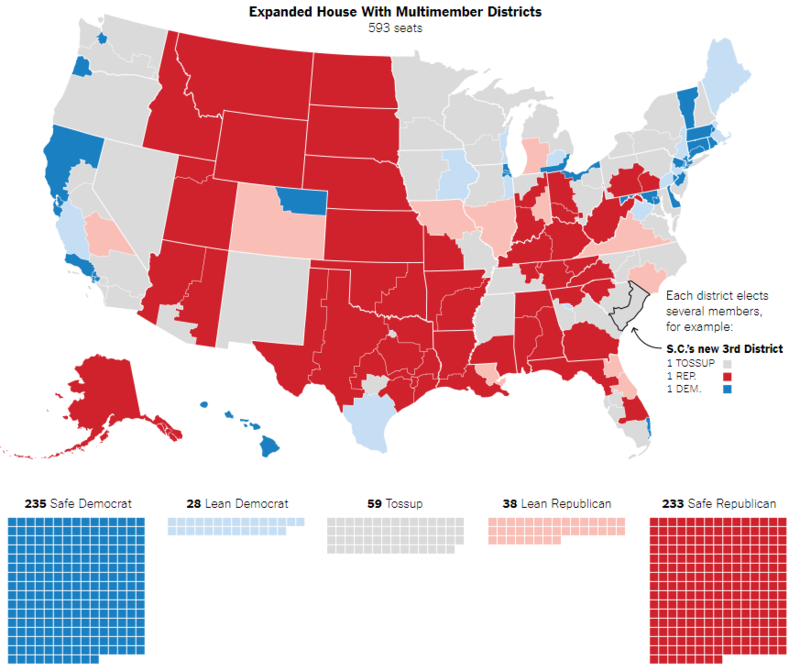 That gives the Republicans more opportunities to game the system: in the 2012 redistricting cycle, the boundaries of 48% of House districts were drawn entirely by Republican officials, compared with just 10% by Democratic ones. One response to all this is to say that the problem is the Democrats’ to solve. They used to appeal outside the cities, towns and denser suburbs; if they were to do so again the constitutional bias towards less populated places would no longer trouble them. But although this may seem like sound politics, it is more to wish away, or paper over, the problem than to solve it. The distribution and make-up of America’s population really has changed. More people live in cities than have ever done so before, and they want, and believe in, different things from those who don’t. Adapting policies to appeal to an ever-shrinking share of the population—just 19% of Americans lived in rural areas in 2016, down from 25% in 1990 and 36% in 1950—against the wishes of the party’s urban base cannot be a stable long-term strategy. Nor is it a recipe for a healthy democracy. An alternative would be to try to make the system equitable given today’s aligned ideological and geographical polarisation. This is not easy. Creating a directly elected presidency or restructuring representation in the Senate would require changing the constitution, and just now the idea of an amendment aimed at either of these goals receiving assent from two-thirds of both houses of Congress is implausible. That said, there is another mechanism for tabling an amendment: a constitutional convention called by two-thirds of the states. This route has never been used, but activists for a balanced-budget amendment have signed up 28 of the 34 states they need for such a convention. If it were ever to be held, other amendments might possibly be tabled there, too, including perhaps some that reform the voting system. Absent that wild card, though, most efforts at reform are aimed below the constitutional threshold. On the electoral college, activists think they have found paths to abolition that not only fit within the constitution’s constraints, but do not even require action by Congress. One of these runs through the courts. A campaign led by Lawrence Lessig, a law professor at Harvard, and David Boies, an eminent trial lawyer, has filed suits in four states arguing that the winner-takes-all allocation of their electoral-college votes is unconstitutional. If all a state’s electoral-college votes go to a candidate supported by just 51% of that state’s voters, they argue, the other 49% have in effect been disenfranchised. How this argument fares has yet to be seen. But to achieve its goals it would need to be upheld by the Supreme Court. Invalidating the voting procedure used for most of American history by the vast majority of states would be a big step for the court—especially given its current conservative make-up. A path that may prove easier makes use of state legislation. 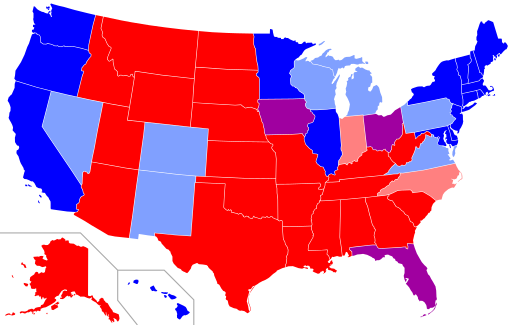 In 2007 Maryland passed the National Popular Vote Interstate Compact (NPVIC), a law that obliges the state’s presidential electors to vote for the winner of the nationwide popular vote rather than the victor in their state—so long as states representing an overall majority of the electoral college have approved an identical bill. Eleven states have since followed Maryland’s lead. The NPVIC now has 172 electoral votes committed, over halfway to the magic number of 270—a majority in the college. So far, the compact has become law only in states with Democratic legislatures. But some Republicans see its merit, too. In the presidential elections of 2004, 2008 and 2012, the disposition of states in play meant that the Democratic candidate would have won the electoral college had the national popular vote been tied, and a “blue wall” of northern and coastal states was said to give Democratic candidates an inbuilt advantage. The holes Donald Trump kicked in the rusty northern bit of that wall, and his coupling of an electoral-college win with a popular-vote defeat, has understandably dampened Republican enthusiasm. But John Koza, the leader of the NPVIC effort, says that as of last year 153 of the 156 Republican state legislators who sponsored NPVIC bills in 2016 are still on board. Last year Saul Anuzis and Michael Steele, the former chairmen of the Michigan and national Republican parties, wrote that the NPVIC was “an idea whose time has come”. The House, too, could be reformed without any constitutional amendment. Again, the legal route looks hard. The Supreme Court sent challenges to various forms of gerrymandering back down to the lower courts in its recent term, rather than issuing a firm ruling. Brett Kavanaugh, Mr Trump’s recently announced nominee to the court, would probably, if confirmed, be less likely to restrict the practice than the departing Anthony Kennedy was. But this has been a banner year for anti-gerrymandering ballot initiatives which bypass governors and legislatures and their party allegiances. In May, Ohio voters approved a measure making it harder for the state legislature to draw up partisan districts. In November voters in Colorado, Michigan, Missouri and Utah will be able to vote for reforms that either make redrawing districts a bipartisan business or outsource it to non-partisan commissions. A more ambitious initiative, if one that is less likely to see short-term success, has been introduced in the House. Don Beyer, a Democratic congressman, has sponsored a bill mandating the nationwide adoption of multi-member districts and ranked-choice voting (RCV), a system used in Australia, Ireland and Sri Lanka. Under Mr Beyer’s proposal, voters would not choose a single candidate, but rank the candidates standing by order of preference until reaching someone whom they did not want to support under any circumstances. When the ballots were counted, the contender with the fewest first-choice votes would be eliminated, and his or her support reallocated to those voters’ second choices. This would then be repeated until the field was reduced to the required size—between three and five representatives, depending on the seat. The system is broadly, though not entirely, proportional. It also tends to ensure that candidates acceptable to a broad swathe of voters are rewarded for that breadth. Mr Beyer says he knows his bill will not pass in today’s Congress. But in June Maine became the first state to use RCV for primaries for Congress and the governor’s race. Various cities—including, recently, San Francisco—have started to use it. In Utah, one of the most Republican states in the country, the lower chamber has passed a bill mandating RCV in elections, though it failed to get out of committee in the state senate. It is hardly a groundswell of support—but it is more than there was. And unlike other proposals for making voting more representational, RCV might go some way to dampening down the dynamics that have made American politics so partisan. The way in which the voting system fails in a country where party and geography align is, after all, just one part of a bigger problem: a constitution that was set up to work with something other than the two-national-party system that the founders wanted to avoid but which, due in part to the voting rules they imposed, captured their country. The founders wanted to ensure that laws would command broad consensual approval: two powerful houses of Congress and the president had to agree on them, the Supreme Court had to underwrite their constitutionality. In a two-party system consensus is not highly valued, and ways of thwarting it are easily found. If government is divided between the two parties, they can use the checks and balances the founders provided to veto each other’s proposals, preventing policies from being enacted even if they might, on their merits, draw consensual support. If one party secures unified control, it can ignore the checks and balances and impose its will on the temporarily powerless opposition, consensus be damned. When parties are broad churches, and when there are causes that, for at least some of their members, matter more than party unity, these problems are minimised. And that is how it was for much of American history. In the early 19th century both Democrats and Whigs were divided into pro- and anti-abolition factions, which made bipartisan alliance easier. After the civil war white Southerners blamed Abraham Lincoln’s Republicans for laying waste to their homeland, refusing to vote for them over the subsequent century. That filled the Democratic Congressional delegation with segregationist and conservative Southerners, producing two parties with considerable ideological overlap. According to Sarah Binder of George Washington University, in the mid-20th century the voting records of over 30% of federal legislators were closer to the overall centre than they were to the midpoints of those representatives’ political parties. But in the 1960s the Democratic Party embraced racial equality. Over the generation which followed, the Republicans were able to take the South from it. By 2010 congressional delegations from white districts in the South were uniformly Republican. The realigned parties became much more ideologically distinct (see chart 3). The voting record of the most liberal Republican is now far to the right of that of the most conservative Democrat. Ms Binder’s numbers show that the “moderates” in Congress can now be counted on one hand. The result has been a great deal of gridlock—aided, in the Senate, by filibusters that used to be rare and are now the norm. Congress has approved around 40% fewer laws per session since 1994 than it did from 1975-94. The baleful equilibrium is punctuated, when control of the various branches aligns, by spurts of partisan lawmaking. At present, the main check on the Republican use of that dominance is their internal division. Since 2010, majority-party leaders have generally refused to bring legislation to the floor that does not command a majority of their own party. As William Connelly of Washington & Lee University writes, “intra-party factionalism curbs the excesses of inter-party factionalism”—but it exacts a cost in stasis. This is not a situation open to easy reform; nor would all want to reform it. Parties try to become strong, and remain strong, for perfectly understandable political reasons. Strong parties can be a boon, though the balance of benefit to risk is better in a system designed with them in mind. And American society is divided in ways it was not before; its partisan politics are in part a cause of that—but in part, too, a consequence of it. An electoral system that has its thumb on the scales, though, is harder to defend. And measures to redress that electoral bias through greater proportionality in the voting system might also help with the broader issues of political division. Systems with elements of proportional representation, such as that sought by reformers of the electoral college or House districts, not only provide bulwarks against charges of illegitimacy. They also have a tendency towards consensus of the sort the founders wanted. There is a reason why, when choosing their own constitutions, no other country has for long survived with a replica of the American model—and why when guiding the design of constitutions for others, as they did in post-war Germany and Japan, Americans have always suggested solutions quite unlike the one under which they live.